A good friend of mine asked my opinion on the “best” method of training style & structure for competitive strongman events. Knowing that I’m (or at least think of myself) an EvilGenius and have been actively competitive in strongman events in the late 90’s & early 2000’s he felt I would have a ready-made answer for him. In truth I didn’t have much of a response prepped for that particular question and felt more than a little self-conscious about my intellectual inadequacy and did what any Genius (Evil or otherwise) would do……………..I bluffed! The next morning I sat down in front of my laptop with the intention of penning him a valid strongman training program that would meet his needs and lives up to the EvilGenius standards. That was 2 months ago! I’ve boiled things down to 2 major schools of thoughts, what ive come to think of as “Integrated” and “segregated” training. I define as a program with a separation (or Segregation) between Traditional gym oriented weight training and the competitive strongman events. A workable example of this would be a scheme where an athlete did traditional weight training motions in the weight room Monday- Thursday and then did a full day of strongman events on Saturday, with Wednesday & Sunday off. 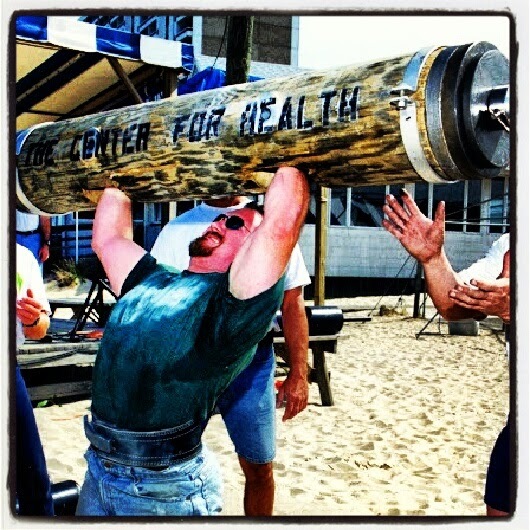 I define as a program with NO separation between; and in fact a smooth integration of competitive strongman events and traditional in weight room strength training. An example of this methodology would be dedicating a day to one (or perhaps two related) competitive events. The athlete would do for example Strong man log press then smoothly transition into “standard” weight room accessory movements that compliment shoulders and triceps. After defining what I think are the two major “types” or “styles” of training available to a potential strongman competitor I put my friends needs and resources into the equation and found he really only had the option of a Segregated Training Scheme. In truth I believe that an Integrated Training Scheme would in the long term be the better option, athletes are most often faced with the option of choosing the most practical over the most effective.